Jim Allister is often the best critic of the DUP and UUP. He plays the part of the little boy among the applauding spectators who shouts out: “Look, look, the king has no clothes”. He’s just performed that role with the so-called Unionist Forum. “I am sceptical about the Unionist Forum. When TUV attended its first meeting we were the only party that reminded the DUP and UUP that the main political parties had failed their electorate on the issue of justice for IRA victims and the new council boundaries which have made it almost impossible for unionists to gain control of Belfast again - regardless of how many turn out to vote -and the flying of the Union flag from Storrnont,” he has said. A few home truths there and the biggest one being that the forum can’t deliver on anything. It was devised as a stop-gap, a talking shop, a cynical ploy to try to take the heat out of the commotion on the streets. In that respect it has already failed as it was bound to. In other respects it has set the clock back. In the first place it displayed the deplorable sectarian reflex in the DUP. Let’s look at the symmetrical position. Take the case of the shootings at Massereene which were among other things a serious challenge to republicanism and to the political direction Sinn Féin had opted for. Suppose Martin McGuinness had reacted by setting up a republican forum to discuss how dissident republican objections to the peace process could be dealt with. What do you think the response would have been? Shock. Horror. Sensation. Suppose further that at the first meeting of that republican forum, say for the sake of argument in Stormont, Martin McGuinness, the deputy first minister was filmed shaking hands with representatives of Eirigi, the Republican Network for Unity and other guys from Republican Sinn Féin and the 32 County Sovereignty Movement. The consequence would have been the collapse of the executive and a DUP walk-out from Stormont. Yet for some reason Peter Robinson and his loyal spear carrier Baldrick Nesbitt (minus a cunning plan) don’t or can’t see how appalled and disgusted nationalists and Catholics are at the unsavoury sight of them hob-nobbing in Stormont with the unionist equivalents of RSF and the 32 County Sovereignty Movement, namely the so-called political representatives of the UVF and UDA - collectively responsible for hundreds of sectarian killings of Catholics. Let’s remember too the UVF is still in business having killed one of their own members in May 2010 and organised disturbances last September and over the past weeks. For a new generation of nationalists who don’t remember the UWC strike unionist politicians coordinated sitting around a table with unionist killers, or the 1986 DUP/Ulster Unionist/UDA ‘day of action’ in protest against the Anglo-lrlsh Agreement, not to mention Ulster Resistance, the first meeting of the Unionist Forum was an introduction to the ambivalent attitude of unionist politicians to unionist violence. There’s no way Sinn Féin would ever contemplate a ‘republican forum’ for a number of reasons.They wouldn’t give dissidents any credibility by involving them in the political process. They loathe and abhor the dissidents just as much as the dissidents loathe and abhor Sinn Féin. Most importantly Sinn Féin can recognise their political enemies, something unionist politicians seem unable to do. Republicans look on in wonderment as Robinson invites his political enemies into discussions, people who despise the FUP nearly as much as Jim Allister does. They watch in amazement as Robinson finds ways to indulge self-appointed community workers who compete with his own party councillors and MLAs to lavish largesse on Robinson’s own electorate. They crease up laughing in delight as Robinson’s sectarian forum insults any prospective Catholic who might have considered voting unionist. All of which demonstrates that unlike Martin McGuinness, Robinson doesn’t know what the obligations of his position as first minister entail. In a crisis generated by the dissidents McGuinness stood by Robinson’s side. 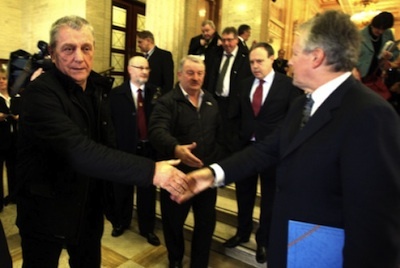 In the exact equivalent, a crisis provoked by what are in effect dissident unionists, Robinson deserted McGuinness and sought comfort in a sectarian talking shop. Is Robinson’s strategy back to the future?